In which mustachioed brigands, having stolen away a virtuous American schoolmarm, set off a diplomatic incident that threatens to bring Teddy Roosevelt’s warships to the gates of the Dardanelles. In 1901, writes Carpenter (Mob Girl, 1992), the missionary schoolteacher Ellen Stone was kidnapped “by a band of unidentified revolutionaries” in the Balkan hinterlands of the Ottoman Empire. Stone had done nothing in particular to bring the event about; the Macedonian nationalists who took her, by Carpenter’s account, had been casting about for a target for quite some time, having considered but then ruled out stealing away a six-year-old Bulgarian prince and assorted other local dignitaries. But Americans, the revolutionaries reasoned, had cash, and the ransom would enable them to buy plenty of guns to turn on their Turkish oppressors. The price for her freedom and that of her fellow missionary Katerina Tsilka, they told Stone, would be 25,000 lira, or $110,000—and “if it is not paid,” they warned, “there will be a bullet for you and a bullet for her.” Long episodes of diplomatic wrangling and haggling, to say nothing of bullying and blustering from the Roosevelt White House, follow, until Stone is finally allowed to go free, slipping into Austria and obscurity. Carpenter does a competent enough job of dusting off this little-remembered tale and of filling in the gaps in the crumbled newsprint, and in her hands the villainous Macedonian rebels of the headlines turn out to have had a point, if not much strategic sense. She gives a fair account, too, of the complex politics of the Balkans, through which an evidently simple kidnapping becomes a matter of honor, revenge, and interethnic rivalry. Still, there’s not much drama in this tale, for all the chest-beating involved. 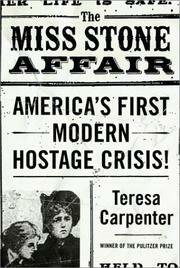 One supposes that the retiring Miss Stone—who gently remarked that her kidnappers “had worked hard for their booty”—would be embarrassed by all the attention.